Just Get Money Reviews - Legit or Scam? Just Get Money Reviews – Legit or Scam? Just Get Money calls themselves an “international private limited investment company,” which was established in 2010 and recently opened their investment program to the online community two months ago. 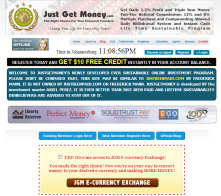 JustGetMoney.com promotes the JGM Tripler system, which claims that for just a minimum $15 investment, you can get a 2.2% daily return – guaranteed – for up to 70 days, and “triple” your money. Though this program is similar to Frederick Mann’s Just Been Paid program, they claim there is no affiliation between that program and this one, founded in Johannesburg, South Africa, by investor Ariel Perez. Just Get Money has five different investment programs that have different minimum investment amounts, ranging from $15 to $8399, and each program has a different rate of guaranteed return, from 2.2% to 7%. In order to sign up for an account at JustGetMoney.com, you must be a minimum of 18 years old, and you must take personal responsibility for knowing the investment laws of your state and country. You can withdrawal your return on a daily basis – excluding weekends and holidays – as long as you have met your minimum withdrawal amount of $28. The Just Get Money investment program – and its newest incarnation, called United Investment Company – makes lots of claims which should make a potential investor cautious. First, they “guarantee” their return rates and they refer to their service as a “turnkey” investment service. There really isn’t any market into which you can invest your money that guarantees daily returns at a set rate for “lifetime,” as JustGetMoney.com claims. An investment program that asks you to invest any amount of money, without giving you specifics on where your money is going, and which guarantees a pre-set return rate for life raises lots of questions. And while those investing $15 may not be as concerned about the answers to those questions, people looking to invest larger sums of money should be. As always, you should never invest any amount of money that you aren’t comfortable losing. Because, despite what Just Get Money says, there is always the chance of losing your investment. Average Rating for " Just Get Money " is 1 out of 5 based on 15 reviews. Just been paid & Profit clicking are still run by the same guy Fredrick Mann was a made up name so I'd stay away from them & Just get money is the biggest joke of the year also so stay away from all these ponzi schemes. Stick with the bank or stock market. Site is a scam. I bought a position and after a short time I could not even login. I tried to contact support per mail, but unsuccessfully. A little later I could not even to open the site. thats true. they scam I can't login and can't contact their support either. STAY AWAY PPL!!!!! Absolute Scam. Vanished with everyone's money. The site is no more. I want to believe this site is a scam.but let give them the benefit of doubt til end of january, if the situation continues. then run. why should we give them another period to scam? yes United Investment Company.is the name on the front page but if you rejoin and inside it still uses just get money pages so don't invest in United Investment Company. I invested $120 of my hard earned money. The moment I requested a withdrawal I was blocked out. I sent several tickets to support re this but to no avail. What I cannot understand though is a family member of mine who joined under me and never invested can log in even as I write. It appears that investors cannot log in but free members can. Just Get Money is a huge scam... I was dumb enough to put in $10K and then another $10K via STP... they lost their STP account because they are being investigated for fraud and money laundering I was told by STP! After they lost their STP account they simply took my money because it was tied to STP! I am out $20K because I believed a recommendation from someone I knew... not too smart from my standpoint! Anyone looking at this checki9ng out JGM - run away fast!!! Yes! Run, run, run away from JGM or United Investment company. I foolishly invested $1200 right away and when I tried withdrawing they deleted my account. The following week each time that I tried to log in the message I received was similar to what others here have described: "authentication failed" I have since filed a complaint with the FBI, but I think they are going to just tell us to be aware of scams. Presently, I am still with Profitclicking. They too have over two million victims that none of them can withdraw their earnings or commissions as they call them. All they stress is more funding from members and new would be victims. Please let's stop giving our hard earned money away. If you want to invest, go to the stock market or any other gov't regulated business that has an internet presence. Let's not recommend any more new victims to Profitclicking or any other scam. Right now the new owners of Profitclicking want to recuperate the money they paid to Frederrick Mann to buy over Justbeenpaid and the cost of their new servers, then they will go to work and block all current victims(members), and then look for new ones. Let's stop them dead on! Just Get Money. The name implies very positive but in reality it is a new scam evolving in the internet online business. I was lured to investing a lot of my own money but to test it I only bought two shares for US$30.00 which it grew up to US$60.00 and then I found out that the scam is that they deny you loging in to your account at their own timing (betwee US$28.00 and US$60.00) available withdrawals from your account. The good thing about it is that I learned in the earlier stages of being with them. My advise look for another online investment but be careful. I thought of having a governing body that regulates these kind of mistreating clients something like in the stock market insider regulations, overseeing by government. Is simply a sad experience. It is a scam just be careful if you are thinking of investing here.